Giddy up little doggies with these rootin’ tootin costumes for kids, hand-knit in London from 100% gen-noo-ine lambswool. 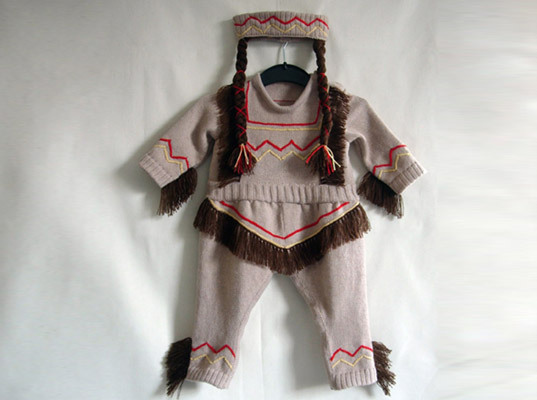 Fitted for tiny varmints up to 9 months (feel free to inquire about custom sizes), each make-believe romper comes saddled with details aplenty for added realism: knitted guns for cowboys and girls, “bearskin” hats for little Buckingham Palace Guards, and braided headdresses for Native American princesses. Parents who have no time to horse around, however, will appreciate the snap fasteners at the business end of things, just in case you need to lend a quick hand before your intrepid explorers head back out west. Wow, They are really cute! Giddy up little doggies with these rootin' tootin costumes for kids, hand-knit in London from 100% gen-noo-ine lambswool. Fitted for tiny varmints up to 9 months (feel free to inquire about custom sizes), each make-believe romper comes saddled with details aplenty for added realism: knitted guns for cowboys and girls, "bearskin" hats for little Buckingham Palace Guards, and braided headdresses for Native American princesses. Parents who have no time to horse around, however, will appreciate the snap fasteners at the business end of things, just in case you need to lend a quick hand before your intrepid explorers head back out west.